Happy Monday! Well, we're right in the middle of a soggy April here in the Pacific Northwest. As I was looking for an inspiration room this week, I found myself drawn to bright colors and floral patterns. I'm eagerly anticipating the warmth and brightness of spring to come! Are you? Here we go! This room is a great example of successfully mixing colors and patterns! Sticking to a defined color palette is what makes it work. 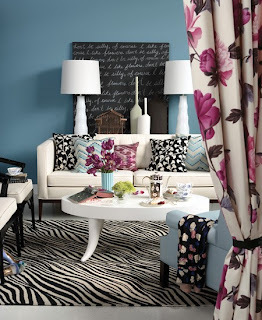 In this room, black and white are the base colors accented by plum and aqua blue. Even the tulips match! In this way, everything seems to "fit" as a whole and you're not looking at pieces individually. Decorating boldly takes planning and a discerning eye. Keep furniture classic. The furniture in this space will never go out of style. I love the color, the shape and the legs of the sofa. You can easily update the look by changing the throw pillows. The side chairs and coffee table are also neutral and can evolve as your tastes evolve. Like a wardrobe, invest in basics and let your accessories help keep your look current. A console table, my favorite piece of furniture! I love the look of a slim table behind a couch. The great thing is... if it's simply acting as a stand for accessories, you can really get away with something inexpensive like plywood and 4 table legs. Throw pillows. I can really get carried away with these! These days, my favorite source for throw pillows is etsy.com. The prices seem better and the patterns are more unique. You can also find fabric and have your local dry cleaner make pillows for you. A chalkboard panel. I'm loving the panel behind the couch. I'm not sure if it's a painting or if it's a chalkboard panel, but I'm inspired! Just have a piece of wood cut down to size and paint it with chalkboard paint. You can write poems, messages, stories on it and change it throughout the year(s). Now that's fresh! A pair of lamps. Accessorizing with a pair of lamps is such a classic look. You can never go wrong with this. Look for simple lamp bases and you can have the flexibility of changing out the shades.